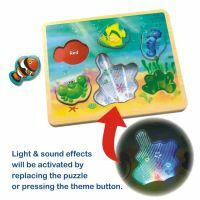 Match the four Treasures of the Sea cutout shapes to their places, and be rewarded with a brilliant light and sound show! Perfect for practicing hand-eye coordination, learning different animals, and shape recognition. Appropriate for toddlers aged 18 months and up.